Sparkle and lace and full of grace, that is what little girls dream of. Combine the two and you have an Angel true. It’s Spring time and what better way to celebrate than to dress up the little princess in your castle in this lace jacket. It’s perfect if you want to add more to an elaborate gown or something to dress up a more simple gown or even a cotton slip. This light-weight sheer fabric will fancy her up without making her too hot. The embroidered flower embellished lace is 100% polyester. The jacket ties are 2″ wide lush satin ribbons. Finally, the glittering sparkles will make her shine like the precious diamond she is. This is one of three from our brand new spring designs. Next up from our NEW designs is our Amy Blessing Dress. A matching headband pulls this quaint little dress altogether. Soft elastic is attached to more flower-vine goodness, while an off-centered satin bow adds that “little something extra”. Every mom wants their little one’s day to be memorable. Let us help with our many accessories and embroidery options. Listed below are some must-haves to create a notable and hassle-free day. Camisole Onsie – not only do these hold baby’s diaper firmly in place during the ceremony, they are great for everyday use (get more and save with our 3-pack). Have her initials monogrammed on the chest for a personal touch. Cotton Diaper Cover – dainty satin-ribbon bows and cotton ruffles adorn the legs. And what could be more adorable than a cross, shamrock, or baby’s name embroidered on the bum! Floral Initial Ruffle Bib – keep her dress pristine with a bib that looks as pretty as the dress. The floral embroidery detail compliment the dress and the flourish initial makes it custom just for her. Silver & Pearl Name Bracelet – divine fresh-water pearls and sterling silver beads encircle baby’s name, spelled in sterling silver letter blocks. Add a cross charm and/or birthstone crystal to sparkle on her tiny wrist. Finally, a half-inch silver chain enables the bracelet to adjust for a lasting fit. Have any embroidery done in your choice of white, baby pink, soft green, metallic gold, or silver thread. White thread offers a subtle look, pink or green enhances her small features, while metallic gold and silver create a timeless feel. For more accessories and details just click here. The name Camilla originates as a Latin baby name. It means noble; free-born; servant of the temple. 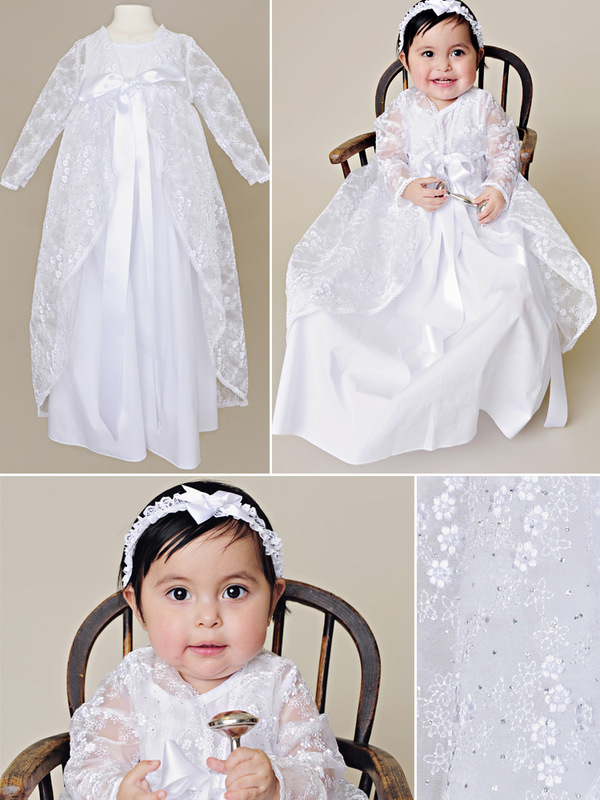 We believe we captured the epitome of each meaning with this satin and lace baby gown. The square neckline brings a sense of noble birthright, just as it did in the 17th century. From neckline to hem stretches a generous floral lace panel with a unique continuous flow. Dual intricate glossy-looping trims each side to confirm superior craftsmanship. Scalloped lace is the final framework as it cascades over the shoulders and circles around the back. This is a flawless introduction to scalloping lace that waterfalls down three-quarter sleeves. This gown is made with matte satin. Our satin is a pure white and lustrous mid-weight fabric. This combination of color and density makes for a temperature comfy baby on any Spring day. A hand-gather waist and 3 buttons make up the back. The gathering offsets the simplistic front design, while buttons make for dressing ease. And finally, the hem is festooned with a double laced edge, and more glossy looped lace. 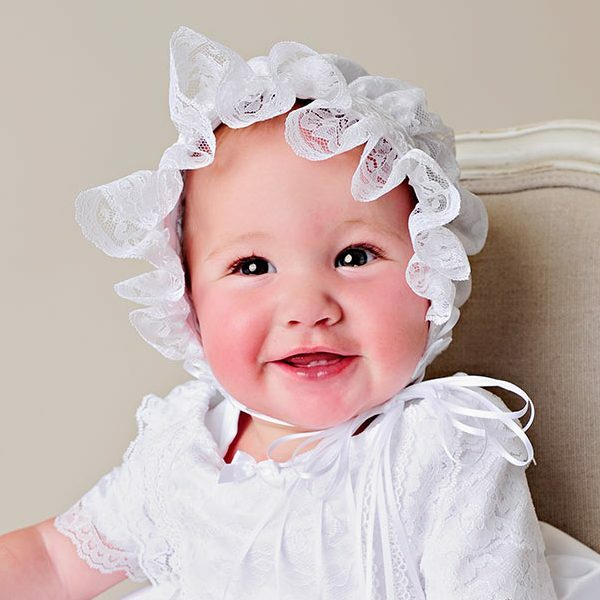 As a bonus, we include a matching baby christening bonnet. An exaggerated ruffle softly brushes baby’s sweet face. A thick satin band accentuates a fully-lined puff style bonnet. The open back design is indicative of a vintage inspired headpiece. Thin triple strand satin ribbons tie under the chin for a secure fit. 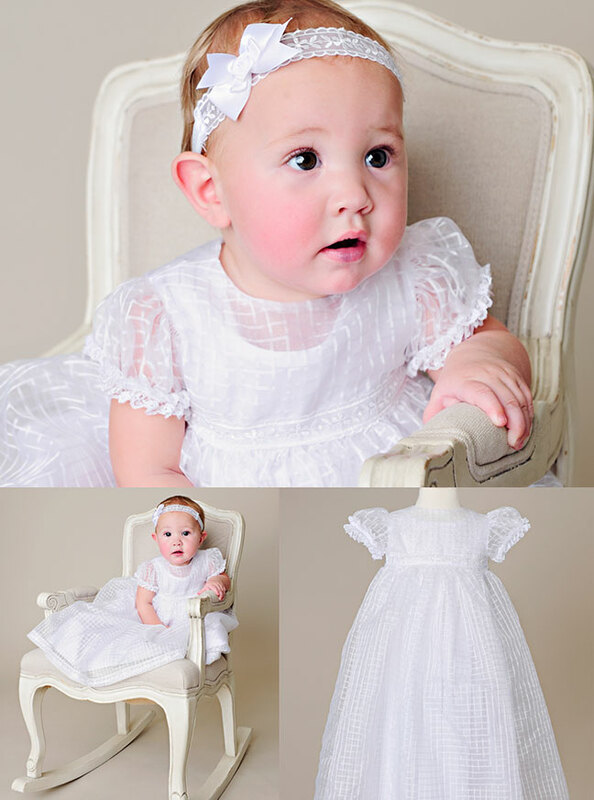 What could be better than a gorgeous christening gown for your little one’s special day? How about matching accessories to complete the look. 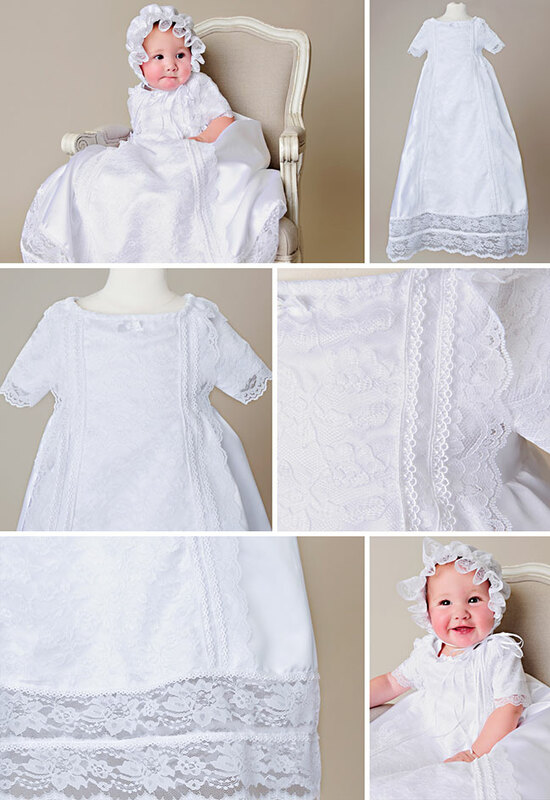 For those who adore lace, pair our Lucy Christening Slippers with this gown. Or maybe a little less frill is more to your liking, take a look at our Bow Christening Slipper in satin. And last but not least, make sure baby stays warm with this glorious Satin Ruffle Blanket. Don’t forget to check out the embroidery options for both the baby slippers and blanket. Personalize one or both to commemorate baby’s special day! Esther–Our New Silk Baptism Gown featuring Embroidered Lace Trim! 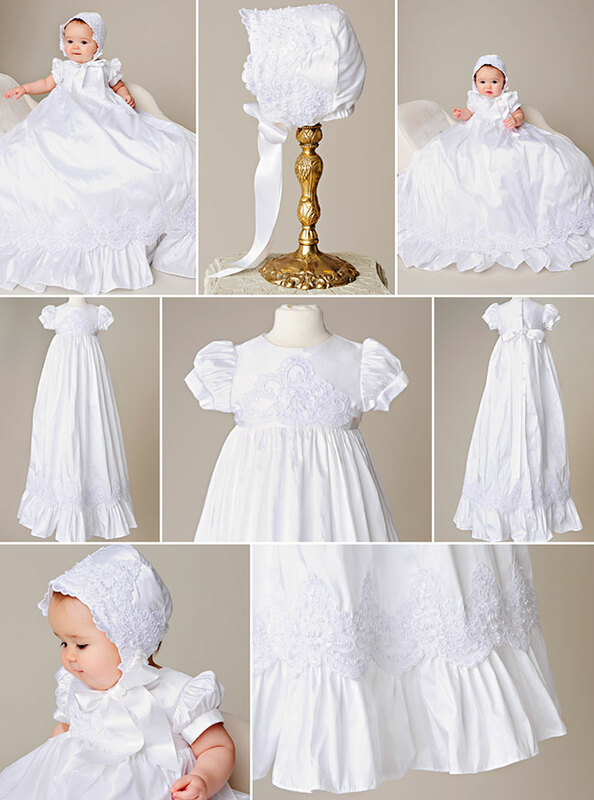 What could be better than a simple, yet elegant baptism gown? How about one that is made with gorgeous pearl-white silk! Our 100% silk dupioni provides an heirloom look with a rich luster & feel! This particular silk is a subtly textured fabric woven from a double strand of silk yarn in a plain weave pattern. The yarn is uneven and varies in width, creating a series of natural horizontal “slubs” that fosters a unique old-world character within the fabric. To add even more vintage appeal, classic silk puff-sleeves accompany a silk high-waist bodice. Followed by a lavish one-inch pure silk ribbon that is used for the dress sash. This brings luxury and allows adjustment freedom for a snug custom fit. For the focal point of the bodice we used beaded scalloped-peaked embroidered lace. The pearl-like beadwork in the center of the lace provides subtle detail, along with impeccable presentation. In addition, this elaborate lace is the highlight of the matching bonnet, along with more one-inch pure silk ribbon for chin ties. Also, the skirt is adorned with additional embroidered lace as it is festooned around the edging like delicate icing on a cake. Dainty beads sprinkle the embroidered lace of both the bonnet and the skirt–so quaint! Finally, the skirt becomes complete with a generous silk-ruffle hem. The grandeur of this gown stands alone. However, we felt personalized embroidery would add the perfect keepsake touch. To do this we have included a soft cotton slip to go underneath the gown. Here a cross, full name and baptism date, or birth date can be a needlepoint work of art to be cherished. By customizing the slip, the gown is left in an heirloom quality that can be handed down to future posterity. Your little one’s blessing day is a sacred event to look forward to. Their name will be officially added to church records and they have the opportunity of receiving a special priesthood blessing. What a special day! Today, we’d like to share some LDS blessing ideas to make your baby’s day extra sentimental. -Dress your little one in a sentimental outfit. There are so many ideas for this! You can make (or have someone make) a blessing dress for your little girl out of your wedding dress. Dress them in your blessing dress or your husband’s blessing outfit. Use an heirloom blanket. That gorgeous knitted blanket that your grandmother made would make a sentimental addition to your little one’s outfit. -Start a tradition. Use the same blessing dress for all your daughters. Have each one’s initials embroidered on the skirt hem. You could also use this idea with a blanket. What an amazing heirloom to pass down to future generations! -Host a luncheon or dinner. Take advantage of all your family being in town and get together after church for some food and reminiscing. -Take some special pictures. You will want good photographs! Capture their little features and special elements of the day. 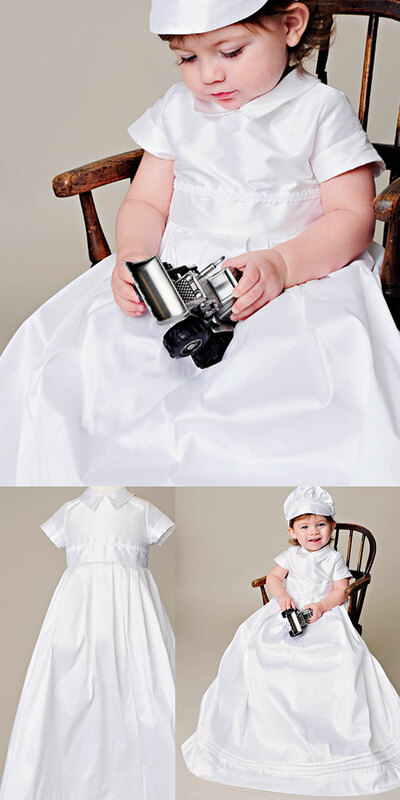 Many mothers now are opting for a professional photo session of baby in their outfit before or after the event. We love that idea, but don’t miss out on the opportunity to snap a few photos on the day of as well. You’ll want one of daddy holding your little one, all the men in their suits, etc. -Write a letter to your little one. Jot down some excerpts from the blessing. You don’t need to write down the entire blessing, but maybe a few things that stood out to you. Journal about other special parts of the day, like when your he smiled and cooed in your grandmother’s arms. Your little one will love reading about their special day years down the road. -Make a blessing day memory mini-book. You could include pictures, information about the ward (who your bishop is, what ward and which stake it belongs to, who the stake president is, which ward building you attend, etc.) the names of the brethren who stood in the circle, some excerpts from the blessing, your feelings as a mother about the special day. What have you done to make your little one’s blessing more meaningful? Share your LDS blessing ideas in the comments below.